Dennis Johnson didn’t see it coming. At 6’5” tall, he knew he could carry a few extra pounds. “I had a little beer belly,” Johnson recalled. But when the scale neared 300 pounds, he was shocked to learn that he was considered obese. But he soon realized that he too had become one of those “big fat guys. “I’m obese,” he now admits. As a diabetic, Johnson could ill afford to neglect his weight and diet. And that is precisely what he proceeded to do by having his “own” plan. He figured, wrongly, that he could eat more if he exercised more. He learned the hard way. The bottom line, Johnson learned, is that fat accumulates when a person consumes more calories – the source of energy – than the body needs to keep the blood circulating, the lungs breathing and other basic functions. But just so many calories are required each day. And the extra calories are unable to disappear as waste and just sit inside the body as a reservoir of fat. Fat cells have an amazing capacity to expand, and can increase to six times their size. In addition, the number of fat cells increases as weight increases. An obese person, then, not only has bigger fat cells, but more of them. And they’re there for the duration. Weight loss can reduce the size but not the number of fat cells. There is a simple solution – simple in words, but harder to do. It’s all about balance. And understanding the fight between two rival hormones. One hormone – ghrelin – produced in the stomach signals us to eat. Another hormone – leptin – produced by fat cells signals us to stop. Both hormones respond to changes in calorie consumption. But ghrelin can go into attack mode if too much weight is lost too quickly. In fact, experts contend that ghrelin often responds by revving up an appetite. More often than not, leptin is no match and the result is slower metabolism and decreased ability to burn fat. That is one reason many quick solution diets fail. But all the fault should not be placed on ghrelin, explained Dr. Malcolm K. Robinson, a weight loss specialist at Brigham and Women’s Hospital. “People overeat for a number of reasons,” Robinson said. Predisposition, genetics and habit all play a role. Socializing is another factor. “There are the family barbeques,” he said. A recent study indicates that eating too quickly may even induce overeating. It’s a good thing that Johnson was battling his weight problem as his wife Ann Marie was battling hers. They realized that they were putting on a bit too much weight – individually and collectively – and together decided to do something about it. They heard about a 10-week program offered by Whittier Street Health Center and Body by Brandy, a fitness center in Roxbury. The program focused on nutrition, healthy eating and exercise. “My wife made me go,” Johnson admited. He now reads food labels and is savvy when eating out. “I eat half a meal and take the rest home,” he said. He has the numbers to prove it. Since he joined the program, he’s dropped more than 10 pounds and lost inches around his waist. His stamina also has increased. Johnson deserves credit for not only his success but his commitment against all odds. “I was the only guy in the class,” he said. His wife is a different story. She was overweight and wanted to make sure she never made it into the “obese” category. More important, she wanted to live longer. “My mother died at 67 of a stroke,” she said. Both Ann Marie and Dennis are aware of the link between obesity and heart disease, stroke and diabetes. But the program that was successful for her husband was not the magic potion for her. She lost inches, but not weight. Her doctor recommended Weight Watchers as a possible solution. But instead, she joined Slim Down Sisters, a 12-week nutrition and weight management program sponsored by the Boston Black Women’s Health Institute. She has learned to expand her palate beyond her Trinidadian taste buds. “I never ate brussel sprouts before,” she admitted. Nor fuyu – a Japanese persimmon. And she now has a few tricks to help her eat the required four servings of fruit a day. “I kept bringing an apple or orange to work to eat, but I wound up taking them home every night,” she said. Her biggest feat came when she could walk away from a pineapple sundae – her biggest weakness. “We need to take life seriously before it’s too late,” she said. 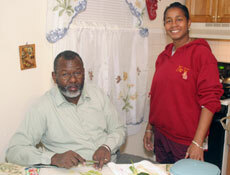 Dennis (left) and Ann Marie Johnson work as a team in their effort toward healthy eating.